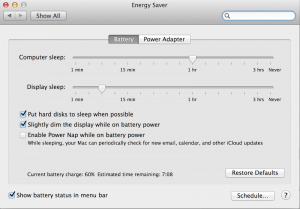 I recently purchased a Mac Pro (late 2013) and discovered that the Energy Saver Pane is a little different; most notably, the Computer Sleep slider is missing. Here is how to get it back. Third, determine the .plist file that corresponds to the model and board ID of your computer; e.g., Mac-F60DEB81FF30ACF6.plist. Finally, wait a minute just to make sure the system has enough time to finish regenerating the kext cache. Then, reboot your mac. Alas, you will once again have the two-slider pane.